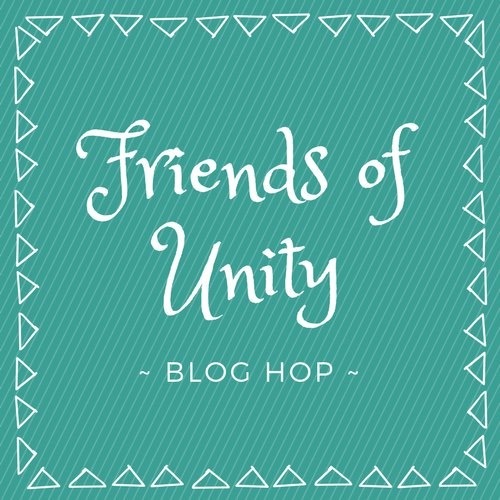 Welcome to our April Friends of Unity Blog Hop! It's Spring and I couldn't be happier! Which is why I love this months cue of "Rainy Days". The ol saying that April showers bring May flowers has me looking forward to the rainy days ahead. This post is a bit lengthy, friends. But I'd love for you to read through as my hope is that you're inspired both creatively and sentimentally! 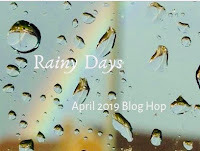 The tag below may not look like it has anything to do with rainy days, but read on. :) You'll love the connection! On most rainy days (especially early rainy mornings) you will find me in my recliner, lights down low, coffee in hand, bible in lap and my favorite southern Gospel playing softly in the background. This is how I love Rainy Days. How amazing does this sound!? Come have coffee with me sometime! As a matter of fact, this tag will be given to a neighbor I've grown close to, as an invite to have coffee with me the next rainy day. Check out the third photo where I tucked in the note inviting her. I attached a premade envelope to the back so I could tuck in a little note inviting her over. I'm really loving this! Angie Blom's coffee cup from "Flutters to Go" is one of my absolute favorites! The background music note set called "Worn Music" was stamped over the masked off coffee cup. I loosely applied VersaFine Clair in Pinecone to the background stamp to give it an even more vintage appearance. The tag base is watercolor paper attached to a piece of cardstock to help give it weight. 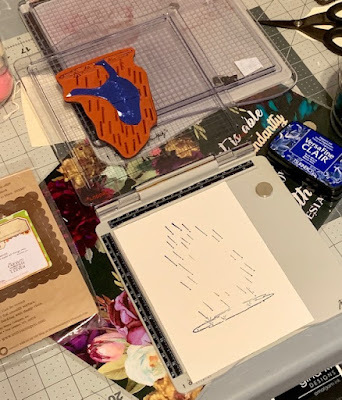 The beautiful blue paper that decorates the top and bottom have become some of my favorite primary color papers to use. They are a heavy cardstock with a beautiful canvas texture and glimmer to them! I bought the 18 sheet set from Tuesday Morning, but it is the My Colors set from My Minds Eye. You can purchase these per color single sheet at Scrapbook.com. I used border dies (aka edge dies) from MFT to cut the top and bottom blue decorative pieces. There are so many things you can do with border dies. I have 3 different sets that MFT sells and love each one of them! Great variety and good number of dies in each set. The blue pieces are popped up with foam tape. I wish you could see it better here, but after I watercolored the coffee cups butterflies I filled them in with Nuvo Crystal Drops. After it dried I took my white gel pen and added the pretty white you see. White gel pen marks over crystal drops on a dark image looks beautiful! I absolutely love the butterflies from Angie's "3 Little Butterflies" set. I stamped them out 2x. Watercolored one set and let my Scan N Cut do the fussy cutting for me. After the paint dried I brushed my Wink of Stella over them followed by random marks of my white gel pen. So pretty!! Here is a card I made with this precious Phyllis Harris set called "All things New". Can't believe I took so long inking up this set. I absolutely love it! This card was very sentimental for me to create as it took me back to my childhood days reminding me of daddy. When we were growing up we played in the rain every chance we got. Growing up without running water, it was also our favorite way to shower as the rain fell over the edge of the tin roof of the shack daddy built us! Ahhhh precious and fun memories... Thanks daddy for such amazing learning experiences. As the sentiment implies; there is such a sweet musical sound the rain gives if we will only be still long enough to listen. Here are the details in creating this card. 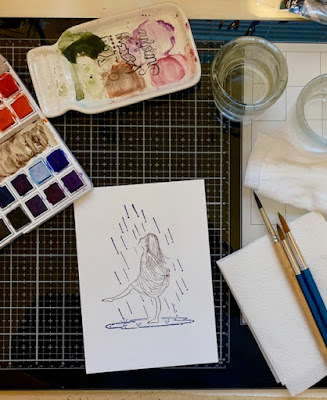 I wanted to use the beautiful Blue Belle from VersaFine for the raindrops and puddle so I masked off the little girl. Here I stamped her in VersaFine's Pinecone rubbing away where the ink had gotten on the rain drops. This is my set up every time I watercolor. 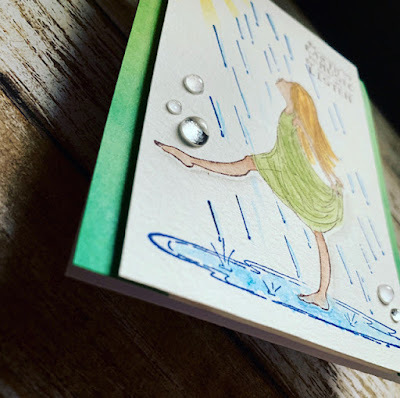 I simply popped her up with foam tape onto a lovely gradient green piece of DSP and added these beautiful "rain drop" flat back bubbles I buy from Ink Road Stamps. The sunburst is from Picket Fence Studios. They have really awesome and very affordable products! I love the slight wave in the puddle I created under her foot. :) She's so so sweet! While coloring this little beauty, I felt she took on my persona of the little girl still inside of me. I still find joy in stomping a rain puddle. Especially with my grandbabies! Do you still relate to the little inside of you? I pray that the memories are sweet for you as they are for me. If they aren't. I'm sorry... Message me here if you'd like. I'd love to pray for you. The sun often shines beautifully on calm rainy days. It puts the sweetest smell in the air. Oh Meg I love it… Thank you so much for your words. I had a friend in my studio yesterday and, in between pulling supplies and showing her how to use them, I was able to stamp out the images from my March KOTM to be colored and made into cards later. While doing that I was reminded of your post and I decided to pull out a Phyllis Harris and an Angie Girl that I have not inked up in awhile. All things New and Rebecca Girl were my choices. Thanks again for the inspiration! I love your stories behind these. Such a great way to be inspired and it shows in your work. Love the envelope connected to the tag. Love the thoughts of playing in the rain! Your writing is as good as your amazing projects! I love that you do, Jeanie. Thank you so much. So humbled! Love these, Bobbie Sue! Such a gorgeous and thoughtful tag for a friend! And your second card brings back childhood memories so effectively! Thank you so much, Joyce!! Oh I love both cards. The coffee card is such a great idea. It is raining now as I hop with coffee right next to me. I love "All Things New" and your card is inspiring. The sun rays and water drops are perfect! I so look forward to your post each month, Bobbie Sue! You inspire me, not only creatively, but also personally... just to be a more caring and kind person. Thank you for sharing a little bit of you each month! Now... your tag is absolutely stunning! I love the Flutter to Go stamp... it's a favorite of mine! Such a gorgeous design and that pocket on the back is perfect! Love it! And your sweet card... oh, I love it! As a teenager, I loved to go for a run whenever it rained. I've always had a love of rain! This stamp makes me think of those times whenever I see it. Cute cards and techniques shared, so nice to be inspired by everyone’s creativity. I’d love to have coffee and visit with you anytime! I love both of your creations for the hop this month, my sweet Bobbie Sue! Thanks for sharing your memories...when I was a child, I had older and younger siblings. My parents didn't stress over us kids, so we were allowed to play in the rain, (and snow so deep it swallowed us up!) thanks for reminding me of those precious memories!! Beautiful tag and card!! really love the tag with the invitation! Amazing! Fabulous card and tag. I LOVE the idea of presenting an invitation with the lovely tag. Your gorgeous tag has many of my favorite things: butterflies, coffee cup, a scripty BG; it's quite stunning really. And all of PH designs are so sweet; plus, I love it when it rains. So the card speaks to me as well. I love the tag, but oh my goodness that little girl is adorable. Thank you for sharing. Loved the cards and the stories! 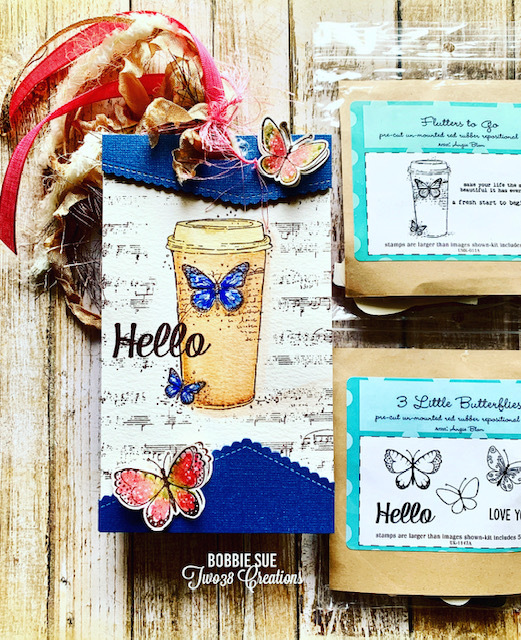 Just beautiful projects Bobbie Sue. I love your cards. They are so kind, spiritual, thoughtful, and meaningful. I love your designs and your stories. I too loved stomping in the puddles as a kid. Thanks for the memories and the inspiration! Such beautiful projects Bobbie Sue. I love the contrast of the blue and white on the tag and matching the butterfly with your blue top and bottom. The little envelope is a nice touch I'll have to use our idea someday! The card is adorable also as well as your sweet childhood memories! Thank you for sharing! 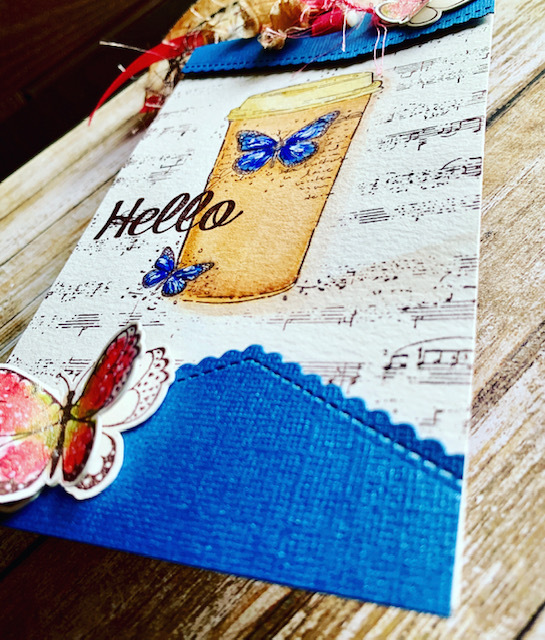 Beautiful coffee-themed tag and a pretty card too! Love the stenciled sun rays with that sweet image! Loving that coffee themed card with the cute envelope on the back and the Phyllis Harris design is always so charming! What a wonderful invitation to receive! Wish I could join you! Thank you for sharing the sites! Love discovering what they have to offer! Love love love.. . No really really love all the projects!!! Here's to the little joyful girl in all of us! Oh wow! Both your projects are so beautiful!!! Colouring and all the details are pretty amazing!!! As a small girl in the south, I enjoyed playing in many rainstorms. The only rule (besides coming in when the sun went down) was if there is lightening, we would have to come back in. We had the most marvelous times playing outside. By the time I had kids (in mid-state NY), we could not let them outside to play without supervision at our house. When we would go camping up in the Adirondacks, we could let them go out further without as much supervision. We would whistle, and they'd whistle back to let us know where they were. We'd ring the bell when they were to come back from wherever they were playing, whether in the woods or on the water. Your card does bring these good memories back! What a wonderful way to invite a friend over for coffee! I love both but that girl dancing in the rain is FABULOUS! Yes! Sounds like a fantastic way to spend a rainy day! 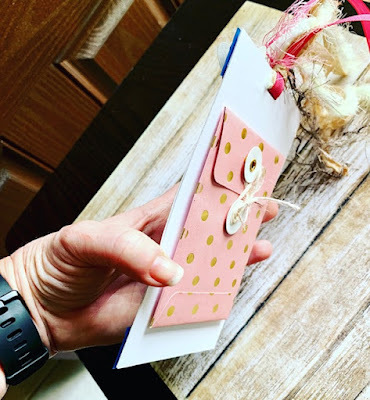 Both your card & tag are just lovely... but, oh, I absolutely LOVE that tag! Wiping my feet dry now from jumping in the puddles. Had rain and a touch of hail today! Lots of worms on the driveway for the robins. I so love this time of year when the birds are starting to come back from the south! Oh, I also love the coffee card- and the nice invite for your neighbor to come over on the next rainy day. How cool is that! Beautiful work!!! Beautiful projects. I love the little goodie pocket on the back. A very thoughtful gift for your friend. Your PH card is adorable! it sounds a wonderful way to spend a rainy die. your little girl in the raindrops is cute. These are beautiful creations! I love everything you make! 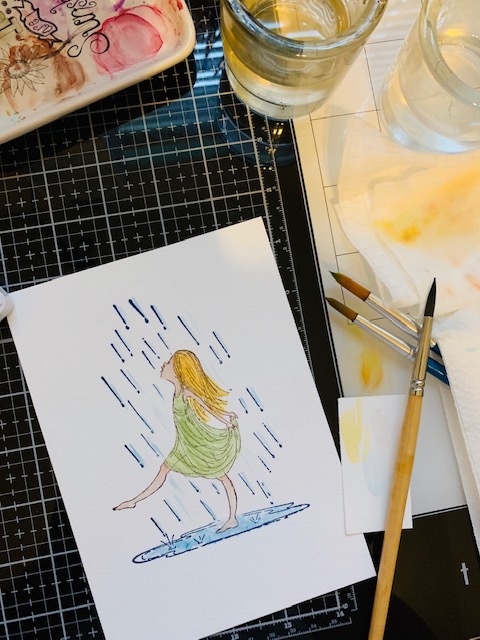 Thanks for sharing your stories - I loved playing in the rain when I was child too! These are really cute! :) Awesome job. Lovely cards. I do like the shimmer cardstock, but only have a few sheets, so I tend to hoard it. I also like how you stamped the girl in brown instead of black to give it a softer look. I don't think to do that very often. Beautiful creations! 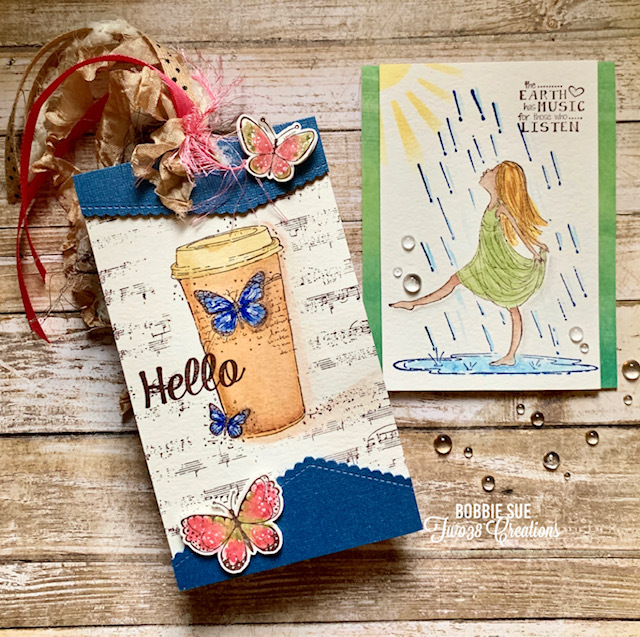 Love the tag and your sweet rain card! 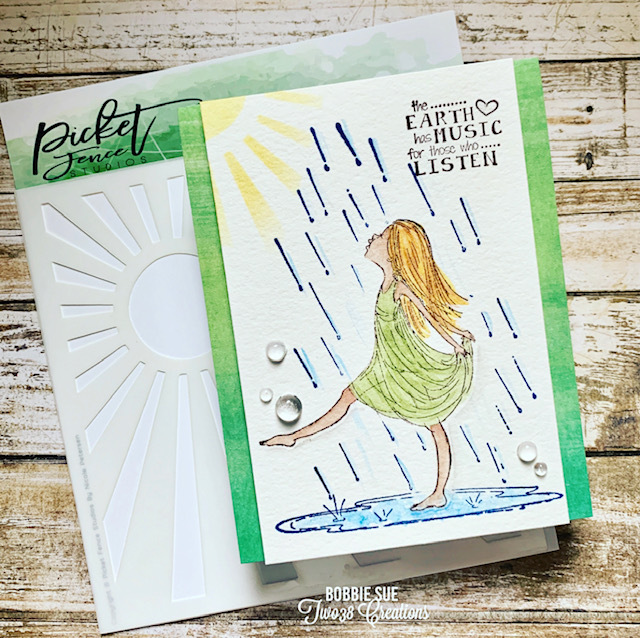 Sweet little girl in the rain and love the tag invite. I very much enjoyed your beautiful creations and your thoughtful and moving narrative!